Bristol 2014: Wilson Benesch unveils 25th anniversary Circle 25 turntable | What Hi-Fi? We've been to the Wilson Benesch room here at Bristol this morning and can report that the turntable is out now for £1750. Or it can be purchased with the ACT 05 tonearm for £3345. It will also be available in black, eventually. The bottom of the turntable is made of Delrin, a dense polymer that helps add 2kg of heft and excellent damping qualities. Further details in our original story below. Wilson Benesch is marking its 25th anniversary with the launch of the new Circle 25 Turntable at the Bristol Sound and Vision Show this weekend. The British high-end manufacturer has added the new turntable to its longest standing product line, the Analogue Collection, which made its debut in 1989 with the launch of the Wilson Benesch Turntable. 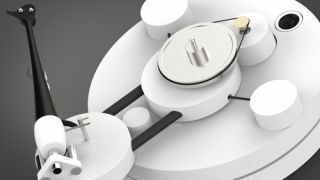 Referencing its classic Circle Turntable, Wilson Benesch has refined the design of the new Circle 25 to include white finishing across the plinth and bearing hubs. It also features a 25th anniversary serial plate on the underside. The Circle 25 comes as a package including the Circle 25 Turntable and the A.C.T.05 Tonearm. The product is available to order to Bristol Show visitors. Wilson Benesch design director, Craig Milnes, says: "The Circle 25 is a celebration of the fantastic history of Wilson Benesch that spans over two-decades. The Circle 25 also underlines our continued commitment to the analogue format. "Since the launch of our first product; the original Wilson Benesch Turntable – our extensive research and development programmes have consistently in some way focused on the development of the finest analogue systems available today."